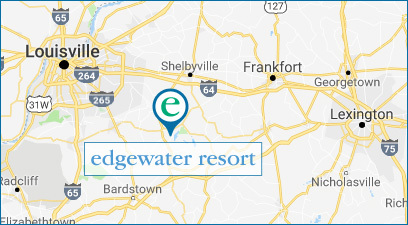 Stay in a spacious three bedroom cottage at Edgewater Resort in Taylorsville Lake — just a short drive from Louisville, Frankfort, and Lexington. Click on a photo below to view a specific cottage. Search on Airbnb to filter available cottages by date. We absolutely loved our stay. The cottage was exactly as advertised on Airbnb and our host made sure to answer all of my questions and went out of his way to explain everything to me since this was the first time we had used Airbnb. I hope we get the opportunity to come back soon! We stayed in a two bedroom cottage. The cottage was clean, roomy, and well decorated with a good view of the lake from the hot tub. Great spot for a relaxing getaway. Hot tub and pool are added bonus! The bourbon trail is close enough to enjoy multiple day excursions. A grocery store is about four miles away which was so convenient for supplies. Will definitely return and recommend to friends and family. Loved having a washer and dryer! I did not have to do a ton of laundry when I got home. A peaceful location. The descriptions on the website fit with the actual resort very well. The kitchen was well supplied and we enjoyed grilling out. Took some bicycling trips from our front door and saw deer and other wildlife. Perfect for our couple's weekend. We enjoyed the hot tub and community pool. The house was perfectly clean and had everything we needed. We rented a boat from the marina, it was a great all day activity and located close to the cottage, highly recommend this if you enjoy the lake life. Edgewater Resort was a perfect home base for our bourbon trail trip. It's less than an hour away from many of the distilleries and from the city. We greatly enjoyed getting a good night's rest, eating breakfast overlooking the lake, and enjoying evening cocktails in the hot tub under the stars. WOW! This cottage was the perfect launchpad for The Bourbon Trail as it's located between Louisville and Lexington on beautiful Taylorsville lake. The cottage amenities the hot tub, fireplace, and other amenities were superb! One of the best Airbnb I have ever experienced! So many personal touches and quick responses. Love all of the extras and how the home was set up. I used the hot tub, grill, dishwasher, washer, dryer, tv -- all were great. We were looking for a central location to explore the Bourbon trail, Churchill Downs, Louisville Slugger Museum, the capital, and the Kentucky horse park. Edgewater Resort was perfect. If you are needing a place to stay while you explore Louisville or Lexington, this Kentucky resort will be a phenomenal experience!